One of the joys of being in account planning is venturing out to explore the lives of people we're trying to better understand. This temporary immersion goes by many names these days: ethnography if you're trained in anthropology. contextual inquiry if you come from the realm of human factors engineering (a term which has always sounded so cold and impersonal, which is quite in contrast to the work they do). While interaction with the people being studies has its place, often the most rewarding discoveries come from pure observation: watching people use the space they inhabit and seeing things that they've accumulated over time. The business challenges that Ford has faced in recent years are well known, as are the mixed success in making the brand more appealing in the face of successful foreign competition. 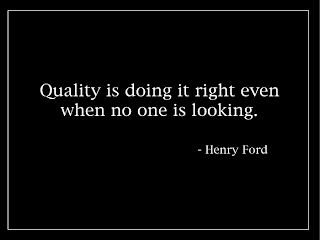 But there's a vein of gold in this simple statement that suggests a pride and a longevity in an age when so much mass production is devoid of human connection to the folks who build them, or service them. Generating buzz for the launch of a new Italian soda brand has brought the entire country to its feet. 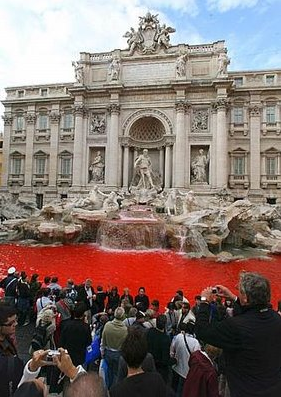 Diavolo Rosso misjudged public sentiment badly when it poured its strawberry syrup into the fountain in order to gain widespread attention. Though the syrup dye won't damage the fountain it's considered an act of desecration for what must be considered a symbol of national pride.. It's a great example of guerrilla marketing gone too far. Delightful branding that adds character to this second hand record/cd store. Given the street is south facing, the shadow is cast on the shop-front the entire day. What other retail brands could use this kind of inventing branding to their advantage? We made an interesting discovery in the fridge this week. Much like its real world cousin, it's the result of two items having fermented and combined over the past month. The first item was commentary on the peril companies face in this age of transparency (Sep 9th) The second was a point-of-view on Dove's latest branding effort, it's Onslaught commercial which seems more rhetoric that authenticity (Oct 7th). The authenticity of Unilever's Dove campaign is called into question because the company promotes the very opposite values through its Axe brand marketing efforts. Well OFD called it before Advertisng Age did. In today's age of transparency, companies can't hide aspects of their operations, sourcing of raw materials or values conflict that they were able to conceal in yesteryear. The web 2.0 age of the internet it spawning a new a climate of corporate accountabilty, one that's forced upon firms whether they like it or not. Marketers can choose to ignore as they wish. The enlightened ones will read the tea leaves and seize it for inspiration and entrepreneurial opportunity. 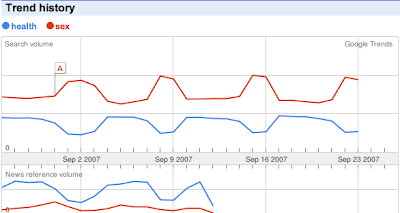 The search was to understand, well, search behavior: the degree to which Americans have been hunting for health content on-line. 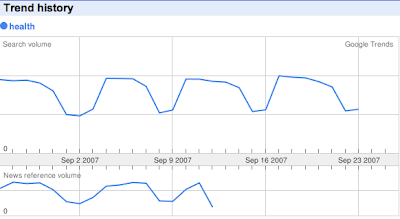 Within moments, a trend line for the volume of searches for 'health' appeared stretching back 2 years, and other to the beginning of 2007. Things got really interesting looking at the weekly trend. A fascinating recurring pattern emerged. The level of searching stays relatively level Monday through Thursday, but noticeably declines Friday through Sunday. The pattern recommences back on Monday. The consistency of this cycle was unexpected. It started us as OFD wondering what could account for the trend: people abandoning their interest in health with the on-set of the weekend. Well, it makes intuitive sense. People want to cut loose, live a little, have some fun. Less interest in wanting to be immersed in the more serious topic and preoccupation of health. It created speculation and a raft of questions. Is this the behavior of the same people? What accounts for the distinct switch in focus as the week progresses? Is being at work inhibiting people from pursuing topics they are more comfortable exploring from home at the weekend? Truly, something that couldn't have been discovered if one had set out to find it. Replacing a process mentality with a method one will serve marketers well. There's ample evidence that advertising agencies and brand partners are re-focusing to meet the new demands of web 2.0 era. Marketers need for change goes beyond mere market place and brand re-oriention, they need to re-engineer critical work practices if they are to survive and thrive. Corporations strictly institutionalized a process approach throughout their organization: highly controllable it helped management ensure business success was consistently repeated. In execution, a process mentality tends to be rigid, often linear and imposes limits on innovative and creative thinking - critical success factors in today's climate. A method approach recognizes the need for focus and flexibility in working practices. Focused on establishing key areas of inquiry - pursued with intellectual rigor - it allows the freedom to engage them in a way that best suits the character of the problem. It also enables the company to better adapt to changes happening more quickly in the marketplace and consumer culture. It has implications for human resource strategy, requiring the deliberate hiring of people with the skills to be capable leaders in this new age of flexible, fast-moving operations. If one is going to reinvigorate a brand, it needs be upon a solid basis that will serve the brand for years to come. Too often however, agencies fall more in love with advertising ideas and devices rather than brand ideas for long-term growth. The initial ambition was simple: connect women with the brand through shared values. This is sound: a Roper study found that this is precisely what unites the world’s top brands with their franchises. The approach was to stir up issue value that could then be used to position the brand as an attractive ally. This too is sound: creating “issue value” is becoming increasingly needed in order to stir an often indifferent or somnambulant public and galvanize them to participate. It is the decision to orient issue value and the brand-consumer shared belief through a moralizing stance on beauty that is not sound. Communications were created to spark a debate about beauty, raising consciousness about how narrow and stereotyped the existing definition is, while introducing a more realistic, healthier, and attainable alternative. It championed beauty on ordinary women’s terms. The campaign for real beauty was the brand’s rallying cry. Visually, the campaign was iconic. Advertising in every channel showed what had previously been taboo: amply proportioned and even large women. They beamed how good they felt in their own skin. It was empowering. It was celebratory. It was inclusive. It saw the viral spread of Evolution, proclaimed it’s “no wonder our perception of beauty is so distorted” by showing the excessive retouching that transforms a women into beauty industry advertising allure. This effort represented a subtle but significant shift. In phase II the beauty industry is being singled out as ‘the enemy’, the force against which the brand and its consumer advocates should continue to rally. The emphasis of the brand however is not on the celebration of women’s beauty in all its wonderfully diverse sizes, colors and shapes. It is focused on fighting an opposition. ‘Onslaught’ has just been released, depicting a young girl being bombarded with beauty industry imagery. “Talk to your daughter before the beauty industry does” extols the brand. Of note is the strategic emphasis. 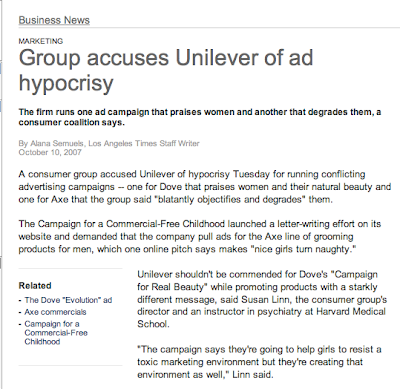 While the opposition continues to be the beauty industry, the focus is again upon children, and Dove is appointing itself as a moral guardian. Or concerned on-looker at least. 1. Telling parents to talk to kids misses two important realities. 1) Kids are influenced by example, not what they’re told. 2) If mothers continue to be so focused on their outward appearance and gaining acceptance of others, worry about their weight ro what people think of them, have 'beauty treatments' like manicures and pedicures, etc. the lack of change in the image problmem of the younger generation will speak for itself. It’s the mother’s that have to change behavior, not preach. 2. Dove encourages parents to face off against the beauty industry, and while Dove’s campaigns continues to champion the rally, unhealthy female imagery and expectations are being simultaneously reinforced by the same company. The Axe/Lynx brands which targets male teenage with fantasy is also owned by Unilever. In an age of transparency, this is ill advised. 3. The celebration of the brand’s inclusive point-of-view about beauty has been pushed aside, at least for now. Granted, there are challenges in keeping a fickle, short-attention span society engaged once they’ve become comfortable with an idea – and the rise of the reality programming genre has certainly diminished the visual distinctiveness Dove’s ‘real beauty’ imagery. The advice for Dove: lose the faux compassion and be authentic. If you’re serious about change, then encourage parents themselves to change and be better role models. Inspire them to be a great example for their daughters. Then perhaps there’ll be sustainable change, not hollow brand gestures. A lot of mathematics taught back in school never seemed to have much practical application in the real world (though important to learn for the principle). The view is from the roof-deck of Stella's Fish Cafe in Uptown. It's a popular scene with the 20 something crowd, who knock back mojitos and margheritas rather than martinis. As one of the few outdoor bar restaurants with a full city view, this mathematical vista is probably a unique selling point for Stella though management didn't seem too interested in the suggestion. Might appeal to the wrong crowd. This is a departure from the usual Stirring Bulletin format. Normally we contrast Middle Ages thinking (pre-enlightened marketing practice) with Renaissance thinking (post enlightenment marketing practice). OFD has come across such an outstanding example of Middle Ages Thinking that it merits its dedicated focus. This satire brilliantly captured the misguided ways of yore: where self-indulgent agencies and their clients were obsessed with espousing their own message, but falling on the deaf ears of consumers who saw through the gesture and artifice. A glaring example of what approach NOT to take. 'Baked goods' is a curious term indeed. It is so rarely used in casual conversation that when mentioned it carries a subtle yet distinctly formal air which stands in contrast to more familiar patterns of speech and turns of phrase. 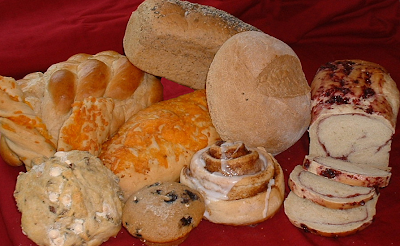 In response to being asked what one might consider eating for breakfast, "I think I'll have a baked good" would seem strange. It also raises another aspect of this infrequently used phrase: it is almost never used in the singular. To utter this term therefore, would seem to require the owner to have - or anticipate being in possession of - more than one. Perhaps ideal for the optimist, the glutton, or those of us preferring to have our cake and eat it too.